That's more like what I expected. Still: I never know whether a glitch I see between CF and Lucee is the fault of one or the other these days, and perhaps there's some precedent in other languages wherein this might be illegal. Python has a reputation of being uppity about stuff, so I'll just ignore that and go with the precedent set by less retentive languages. ColdFusion is being daft here. But here is my dilemma. 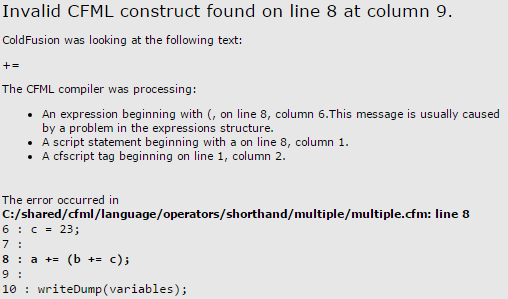 Given the docs say there should be only one shorthand operator per expression... which of these ColdFusion examples is "wrong"? Is this limitation by design, in which case the no-parentheses version is "wrong"? Or is it a daft rule they decided to lift at some point, but didn't do a thorough job of it? I guess it doesn't stand being analysed too much. The rule is a dumb one, and should not be there. I'll raise an bug report to get it removed: 4023966.